I had a beautiful day for shooting my last pics of the year. It was cold, but the sun was in and out. I was lucky to see lots of my bird friends. 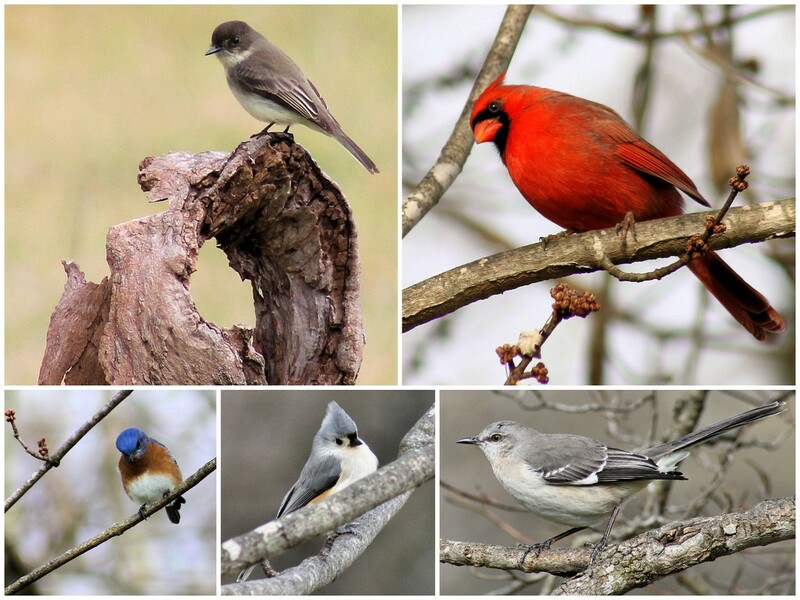 Starting from top left to right are an Eastern Phoebe, Northern Cardinal, Eastern Bluebird, Tufted Titmouse, and a Mockingbird. This has been my most challenging year to do the 365. I started working a full time second shift job five months ago. I was determined to keep doing my project. I get up early every morning, so I have time to shoot and post. I haven't been able to comment as much as I would like, but I do try to look at your lovely pics and fave. I have taken my pics and posted same day for 4 years. There have been a few times that posting has been a squeeker. Congrats! A terrific bird collage! It's so interesting that two years ago, I could only name the cardinal. Now, I know them all. The Blue bird is so lovely too. Congrats! Congratulations on completing year 4. Beautiful collage! Congrats on completing year 4! I agree it is addictive! All of them are so sweet, a wonderful collage Carolyn and congrats on finishing your 4th year! How did you do it??????? Happy New Year! These are all just gorgeous Carolyn! I have so enjoyed your bird pictures. Happy new year.